The John Lennon Educational Tour Bus is a non-profit 501(c)(3) state-of-the-art mobile audio and HD video recording and production facility. In its 22nd year, with the very newest technology and gear, the Bus continues to be dedicated to providing young people with tours of the studios, participation in free digital media production workshops, and the production of giant peace signs. Assisted by three on-board engineers, students can learn how to write, record, and produce original songs, music videos, documentaries, and live multi-camera video productions – all in one day! 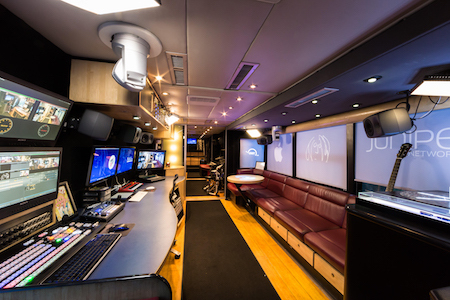 The Lennon Bus is highly adaptable, designed to provide students, their schools and communities with performances, hands-on demonstrations, remote recordings, and studio sessions customized for their needs, levels of experience and interest. The Bus travels the country visiting schools, music and technology conferences and events, and partners with communities and media outlets to call attention to the importance of arts and digital media education. Apple, Inc., Other World Computing, Canon U.S.A., Inc., Nearpod, Juniper Networks, Yamaha, Securematics, Neutrik, The NAMM Foundation, Ruckus Wireless, Adobe, Avid, Audio-Technica, Genelec, K&M Stands, Sonnet Technologies, Focusrite, SSL, NewTek, Reflecmedia, Viprinet, Baker & McKenzie, Litepanels, Clear-Com, Anton/Bauer, AJA, Copperpeace, Applied Acoustics Systems, Mobile Roadie, McDSP, Native Instruments, Antares, Noise Industries, iZotope, Mad Mimi, Ableton, Mackie, Guitar Player, Bass Player, Electronic Musician, Keyboard Magazine, SKB, and LiveU. Request the Bus - Send us your contact information.